Twelve months after Bradley Wiggins won the prestigious Vélo d’Or award, his Sky team-mate and Tour de France successor Chris Froome has done the same. The British rider clocked up five stage race wins this season, beginning with the Tour of Oman and then continuing with the Critérium International, the Tour de Romandie and the Critérium du Dauphiné. His Tour de France success was the biggest of those, with Froome clocking up stage wins at Ax 3 Domaines, Mont Ventoux and Chorges, and beating runner-up Nairo Quintana (Movistar) by four minutes and twenty seconds. 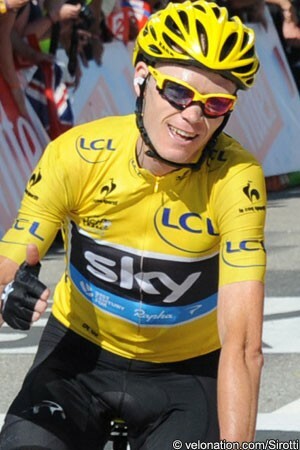 Froome attracted the most votes in the competition, which is decided in a poll of cycling journalists carried out by French publication Vélo Magazine. Giro d’Italia winner and Vuelta a España runner-up Vincenzo Nibali (Astana) was second while Tour de France green jersey winner Peter Sagan (Cannondale) took third. Paris Roubaix/Tour of Flanders victor Fabian Cancellara (RadioShack Leopard) was fourth, and world champion Rui Costa (Movistar) ranked fifth. “To win an award as significant as this is a fantastic way to cap an incredible season,” said Froome, commenting on the news. “I was fortunate enough to win the International Flandrien trophy a few weeks ago and to win this one as well is really satisfying. Meanwhile Quintana took the vote for the best young rider, while Alpe d’Huez stage winner Christophe Riblon (Ag2r La Mondiale) was best in the Vélo d’Or France ranking.